Small kitchens are not uncommon in the world, and the problem of limited cooking areas has existed for many years. 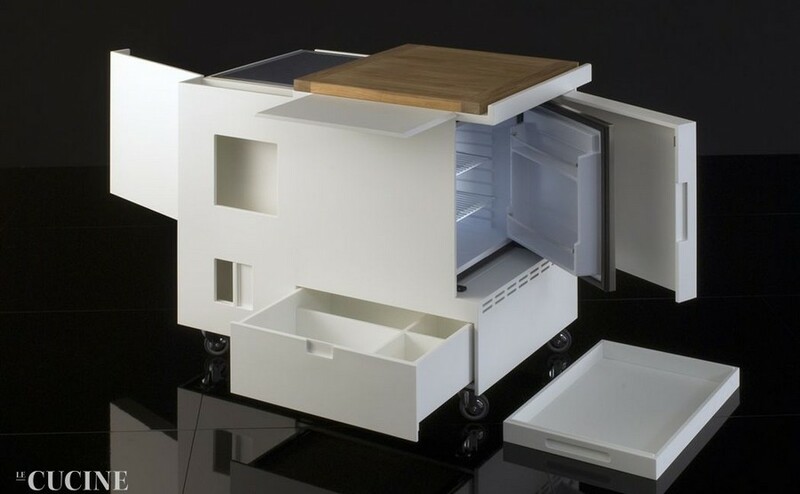 How else to explain the fact that a mini kitchen suite designed by an Italian furniture designer Cesare ”Joe” Colombo back in 1963 is still as popular nowadays as it was over 50 years ago? It’s not just storage compartments – it’s a small, yet very functional and mobile set of everything that a hostess needs to prepare food. Its author was one of the brightest representatives of futuristic residential design of the 1960s and nowadays re-designed replicas of his sets are admired by many leading manufacturers and common mistresses. Over 50 years of its existence the set has changed only in terms of materials used for making it, while the functional aspects are exactly the same as they were half a century ago. Today’s replica is made from 120-mm-thick corian – a unique modern material that surpasses stone in its practical characteristics. The doors of cabinets can be faced with wood, glossy lacquer, matte varnish or aluminum. The set includes a solid natural teak worktop, a built-in induction cooktop with touchscreen control, and even an incorporated mini-fridge for 50 liters. 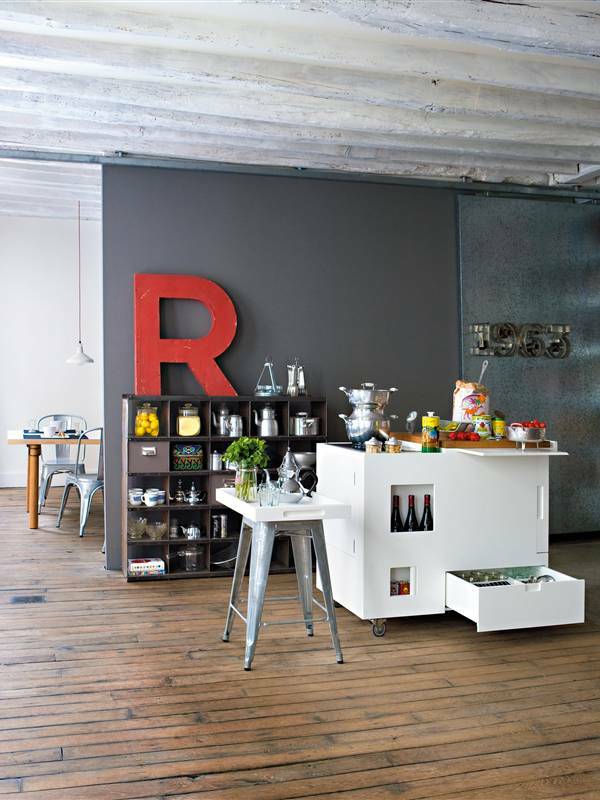 The kitchen rotates 350 degrees thanks to wheels with brakes. 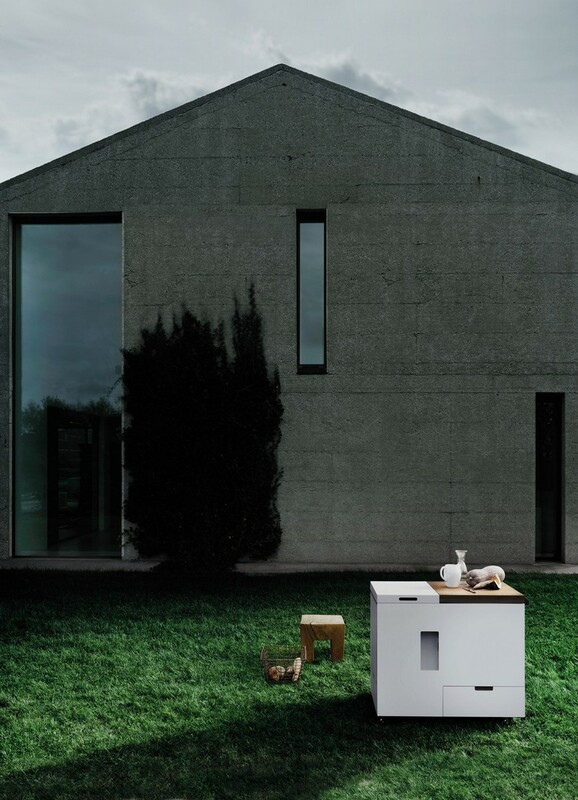 The current manufacturer is the Boffi Cucine Company, Italy. 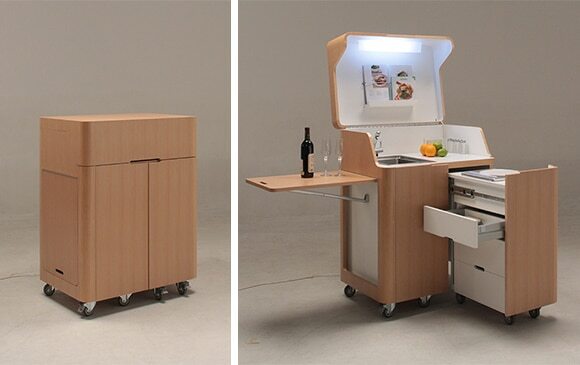 A similar kitchen solution is offered by the French company of Kitchoo. 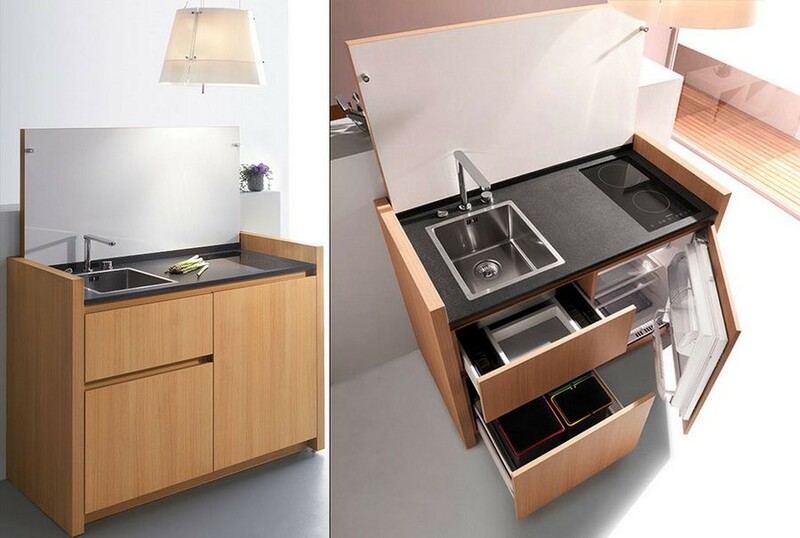 Their multi-functional and ultra-compact kitchen suite is sized like a common cabinet. 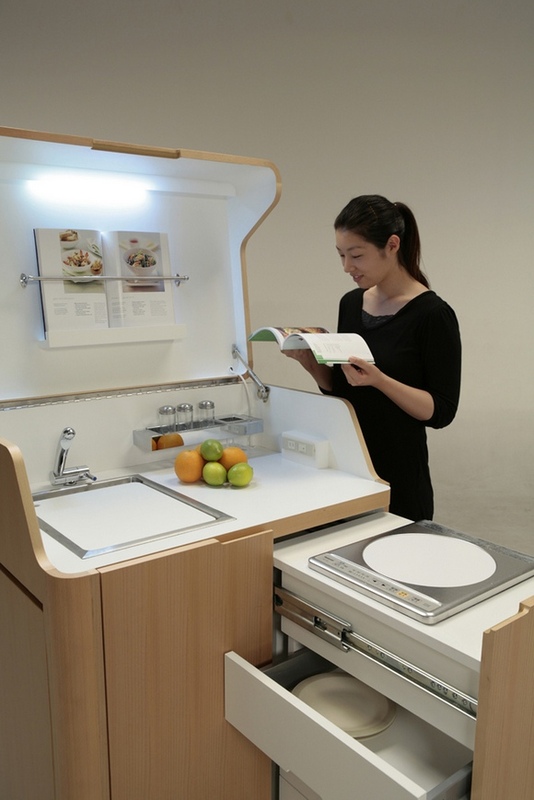 It features a sink, a mini-fridge, a two-burner stove, a dishwashing machine, and a microwave oven. And it looks super stylish. 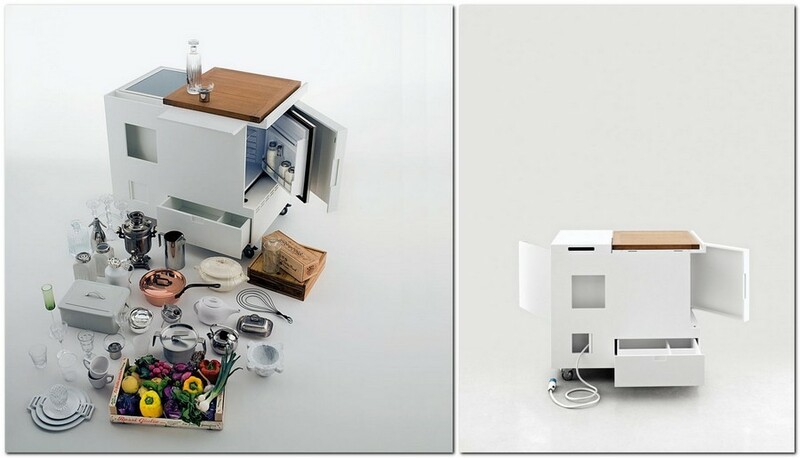 And finally, the Japanese have designed a mini-kitchen system of their own. It’s dubbed Kenchikukagu and equipped with absolutely everything – from lamps and sockets to a cooktop, a compact worktop, a sink and plenty of storage compartments and shelves.